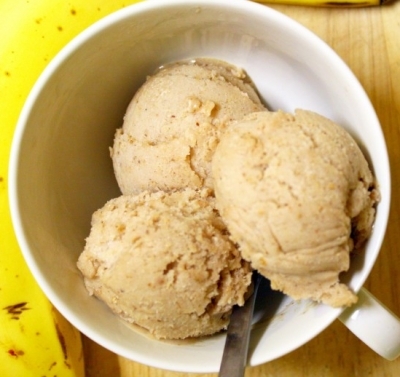 2-Ingredient Simple, healthy and delicious ice-cream! Slice bananas and arrange them evenly in a bowl or a plate. Freeze until soft-firm, 1 to 2 hours. Transfer bananas to a food processor, process until smooth. Add the peanut butter to the food processor, process until smooth. Add whey protein if desired. Scrape mixture into bowl and freeze until semi-firm, 1 to 2 hours. Add any toppings if desired. Enjoy!